(Raleigh, NC) In response to DOJ's announcement they are open to investigating Silicon Valley corporations, Americans for Legal Immigration PAC is releasing new activist instructions today and reaching out to other groups to organize a ground-based lobbying effort in Washington (Oct 2-4) to combat the systematic censorship and shadow banning of American conservatives, Republicans, Trump voters, illegal immigration fighters, Christians, and other non-socialist activists and organizations. ALIPAC and Oath Keepers announced this new coalition effort on August 31 (View), and are now taking steps to expand the coalition and ask concerned Americans in all states to reach out to the White House, the Department of Justice, and Republican members of Congress to ask for protection from abuses of power by Silicon Valley mega-corporations like Facebook, Twitter, and Google. This coalition contends that the real interference in US elections comes not from Russia, but from George Soros funded groups and powerful Silicon Valley corporations beholden to China which now yield more power in some cases than the government itself. ALIPAC is now asking individuals and organizations to: 1. Prepare formal written documentation of the bias and abuse they have experienced or witnessed by Silicon Valley corporations; 2. Make these documents available online for the public, press, and lawmakers; and 3. Send certified mail copies to the White House, US DOJ, GOP state Attorney Generals, and Republican members of Congress. 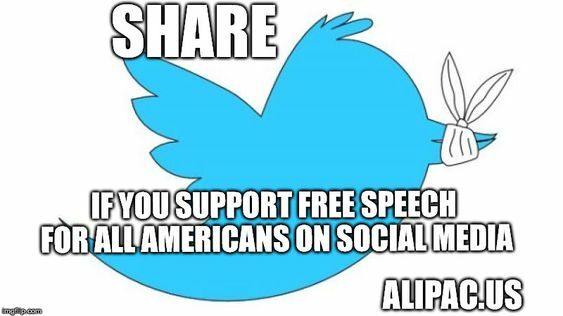 ALIPAC contends that it is of no use to appeal to Democrats since they benefit from Silicon Valley censorship, and elected Democrats are calling for these companies to crack down on conservative non-socialists even more! Groups and activists who would like to join the door-to-door lobbying effort against Silicon Valley censorship which can affect the outcome of legislation and elections are encouraged to contact ALIPAC or Oath Keepers to be a part of the historic effort Oct 2-4. Groups and activists are encouraged to write up their experiences, get that information up online, and start using the the United States Postal Service to flood the offices of law and policy makers seeking justice for all of the Americans who are receiving biased unequal rights and services from Google, Twitter, Facebook, PayPal, and other Silicon Valley companies which are trying to take over America. Other groups and activists facing Silicon Valley censorship include, but are not limited to, Diamond and Silk, Center for Immigration Studies, Ann Coulter, Alex Jones & InfoWars, California Republican congressional candidate Elizabeth Heng, executive director of the Ron Paul Institute Daniel McAdams, Milo Yiannopoulos, Tennessee Republican Rep. Marsha Blackburn, Prager University, Overpasses for America, Ex-Muslims of North America, Canadian intelligence expert and prominent anti-Islamist researcher Tom Quiggin, Jihad Watch, David Horowitz of FrontPage magazine, YouTubers James Allsup, Lauren Southern, Steven Crowder, Fox News contributor Michelle Malkin, and many others. Twitter is now flagging use of the legal term "illegal alien" as "hate speech," while the DOJ is reminding everyone illegal alien is the proper legal term for illegal immigrants. Last edited by ALIPAC; 09-12-2018 at 01:52 PM. ALIPAC and Beezer like this. Add "Criminal Alien" to the ban.